Play Theory: This flag football play is called 83 Mirror. The two receivers on the left are running an 8 route (Red) and a 3 route (Blue). The same routes are mirrored on the right with the lone receiver and the center. This play works best against man coverage and a cover 3. Versus man coverage, the center should have lots of free space. However against a cover 3, this play is virtually unstoppable. On the snap, the two cornerbacks should run with the two wide receivers, leaving the underneath routes wide open. With the linebacker most likely covering the center, Blue should be wide open. Because the corners are bailing with the receivers, this play can also net a good chunk of yards after catch (YAC). Play Variations: Against a cover 2, this play is somewhat limited because all the routes end up in a defensive players zone. However, some adjustments can still lead to big plays. Prior to the snap, the quarterback should be able to read whether the defense is cover 2 or cover 3 (two safeties vs one safety). If facing a cover 2, the Blue receiver can adjust his route from a 5 yard out to a 10-15 yard out. If the corner plays tight to the line, Blue can sneak in behind. If the quarterback rolls left, the corner will either back peddle to Blue which then the QB can just run. Or the corner will come up for the tackle which leaves Blue naked for a big gain. Play Calling Tip: The quarterback can help the offense by recognizing the defense pre-snap. He can relay this information to the rest of the team via a few simple calls. “Double” “Two” or “Twin” can signal cover 2. “Triple” or “3” means cover 3. 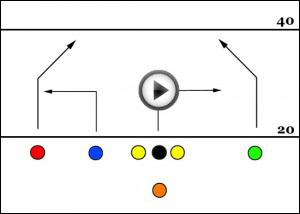 Download a copy of the free flag football playbook. For additional Free Flag Football Plays visit the Free Plays section of the website.